Please frequently check OUTREACHES on League of Prayer Web Site. We shall provide snippets on some of our major works and trust you will join us in prayer for the success of these among some of earth's neediest. Whenever natural disasters strike, we usually have funds and people on the ground before the government or Big Ministries put their boots on. R) The late Rev. Dr. Simon Peter Cameron, a dear friend and co-laborer with us. 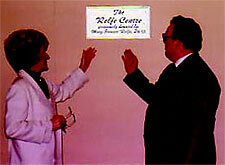 This was Dedication Day of The Relfe Center on the campus of New Hope Bible College, Peterhead, Scotland. From this Center, infinite amounts of humanitarian aid have been collected and sent to many European destinations. A League of Prayer Tent School for 3,000 Pakistani girls, victims of the monster earth- quake of October 8, 2005. The first of five schools we funded in Baku, Azerbaijan for refugee children who had never attended a school. They ranged in ages from 5 to 13 - all began in the First Grade. This first school was built for 800, but at the beginning of the 2nd semester, 2,719 had registered and were attending A.M., P.M., and Night Sessions. The other four were enlarged. 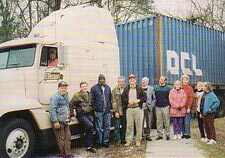 R) Brian Taylor, League of Prayer General Manager, loading the 18 wheeler for one of the 19 trips he made coordinating our Gulf Coast Relief for Katrina victims. God puts things in our hands that He may determine what's in our hearts. One of 30 homes built for tsunami victims; constructed of blocks with tile roof, full power, Kitchen, LR, 2 BRs and bath. 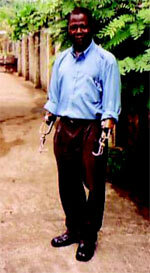 Jesu, a double amputee in Sierra, Leone, W. Africa is driving a cab again, thanks to his prosthetics. Built 143 homes in Honduras for victims of Hurricane Mitch. Provided an After Care Center, four schools and two churches, library, etc. for ex-child prostitutes and children at risk in Cambodia. Funded five schools in Baku, Azerbaijan for refugee children. Sponsored a Prosthetic Center in Sierra Leone, W. Africa. Supported missionaries and evangelists in India, an Orphanage, a Health Care Center and funded a High School Hostel in N.E. India. Supported Missionaries and Prayer Center, school, churches and transportation in the Philippines. Sponsored a Center for Filipino maids in Hong Kong. Drilled wells for poor Zambian Christians where women walk 6 miles a day for water. Provided emergency food for starving Zambians during drought of 2005. Purchased blankets & tents by the thousands for earthquake victims in Pakistan. Wired immediate funds for 30 homes in Sri Lanka and Indonesia for those who lost everything in the tsunami. Rushed funds for food and medicines for earthquake victims in Indonesia. 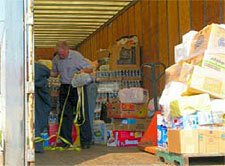 Responded to Katrina catastrophe with loaded 18-wheelers making 19 trips, plus some lesser loads, etc. Another container of foods and medications loaded at our Alabama warehouse to care for fleeing refugees from Albania and Bosnia.